With contributions by Oliver Klimpel, James Hellings, planningtorock, William Haggard, Alexander Garcia Düttmann, Friedrich Tietjen, Eva Weinmayr, Carolin Lerch, Mia Frostner & Robert Sollis (EUROPA), Franciska Zólyom, students of the System-Design class ...Is it possible to understand graphic design as a practice beyond an object-centric approach, as a practice beyond the conception and production of well-designed and printed artefacts? Which other potentials to create a public should be considered integral to design as an activity? 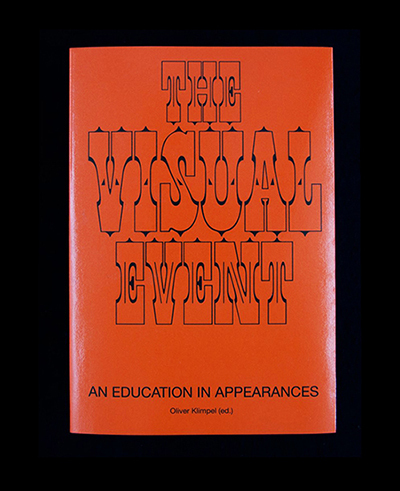 “The Visual Event” explores the question of how such an extended practice could be thought, which graphic, spatial and temporal forms such a situational practice could take, and tests the idea of the “visual event” from various perspectives of visual culture. The project compiles numerous contributions by artists, academics, designers, architects, and students of the System-Design Class at the Academy of Visual Arts Leipzig.